Another apocalypse book? How is it possible to find another way to tell an apocalypse story? 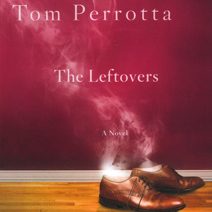 Surprise strikes when author Perrota takes a tired and worn concept and turns it on its head. The story centers on a town called Mapleton. Where the typical apocalypse story has a rhyme or reason, the Leftovers does not. Random people have just gone missing. But based upon the actions of some of the “disappeared”, it is obvious this was not the Rapture. Some of the “disappeared” were innocent children, or the pastor of the church; some of the disappeared were the town adulterer or the criminal who was in the middle of a crime when “the event” happened. But if it wasn’t Rapture, or a nuclear event, or some other unnamed but clearly frightening and catastrophic, what was it? The event is referred to as the Sudden Departure. We walk with Nora, a mother whose husband and two young children are departed. The Leftovers is also told from the viewpoint of Kevin, who is the mayor of Mapleton. Kevin sustained no familial losses in the departure, but he has a son who is touring the country with a fraud; a fraud who is cashing in on the Sudden Departure; a teenaged daughter, Jill, who is discovering herself; and a wife, Laurie, who has joined the Guilty Remnant, or GR. The Guilty Remnant spends its time dressed in white shapeless garments, always smoking a cigarette, never speaking and always making people feel very strange. The GR believes they are being punished by being left behind and are there to serve as reminders of what people are continuing to do which has left them, well, leftover. This story delves into the viewpoints of each of these people as they deal with being leftover and the inexplicable loss of loved ones, neighbors, co-workers…. When making small talk with her sister Karen, Nora thinks to herself, “There was nothing to it…you just keep babbling, piling one inane remark on top of another. The trick was to sound like you were interested, even if you weren’t.” Nora is not coping at all with her losses and at the time of the telling, three years have gone by. Some of the people are able to move on, and some are not. As the story gets into the thoughts of those that dealing with the Sudden Departure, it becomes clear that some people are extremely good at putting on a happy face and functioning day to day, and some people just aren’t. This book makes a statement about all of us, and how we hit issues in our lives head on, or how we avoid those issues no matter the cost. While this book has a serious overtone, it also has a humorous telling that is sure to make you grin more than once. You might see yourself in some of these characters, at once the blind leading the blind, or heading with strength into the future. This is not a religious book; this is not about Christianity. This is about people. Whether they band together or whether they fall apart. This is about relationships, or lack thereof. There is a compelling question throughout about what is important in life, while also being a page turning, entertaining read that will surely leave a lasting impression.